Dan Leno was the greatest comedian of the Victorian Music Hall. His real name was George Galvin, and he was immensely popular, pioneering the style of stand-up comedy. 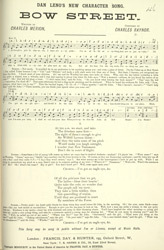 Each of his acts was a character study, usually starting with a verse of song and then going into a character monologue as, for example in this song when he plays an usher. The humour in the lyrics was not due to individual witty lines but rather is an accumulation of many 'play on words'. His comic effect was achieved by changes of tone and perfect timing.